This is an advertisement for saucepans manufactured by B. Perkins and Son.18th century kitchens were full of gleaming copper and brass saucepans, impressive to look at but heavy and difficult to keep clean. Brass slowly gave way to iron that although was no less heavy, did require a lot less cleaning. 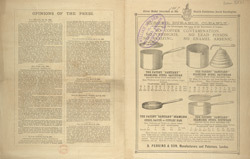 The steel industry developed at the end of the 19th century and soon kitchens were full of the cheaper, lighter and more practical steel saucepans.